Pop Some Bottles Open with the Help of This Ferocious Beer Bottle Opener by Indie Craft Supply Company! Don't be intimidated by the ferocious look of this black Grizzly bear! The only thing this cub wants to sink its teeth in is your bottle caps. Let Your Guests Help Themselves to Drinks and Feel Free to Enjoy Their Company! Made from durable cast iron from a custom single mould, creates this vintage design with high-quality details. This rustic Grizzly beer bottle opener will easily grip and open your beer, soda or fizzy drink bottles without spillages. A Great tool for any home bar, this wall mounted bottle opener will make entertaining easy - let your guests help themselves to drinks and spend more time relaxing and having fun! 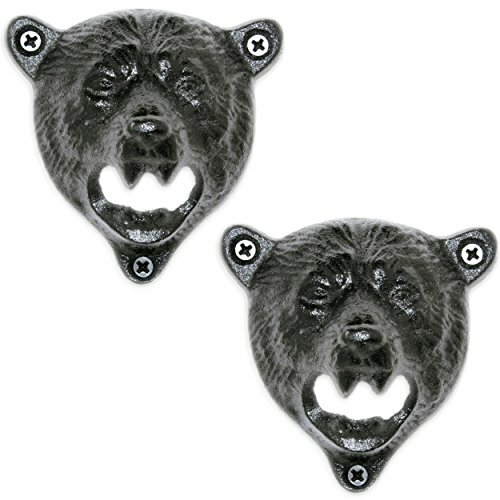 Get Your Grizzly Bear Beer Bottle Opener Complete with Everything You Need To Mount It On Your Wall! Included in the package you will find three, #6 3/4", black aluminum wood screws, making your vintage bottle opener easy to mount right out of the box. Are you looking for a quality gift for the beer lovers in your life? Unique and compelling, this wall mounted, cast iron bottle opener is sure to raise a smile when your friends open the package. ENJOY YOUR BEERS IN STYLE: A must have tool for any bar owner with a sense of style; this antique Grizzly bear beer bottle opener is perfect for the kitchen, garage, bar, patio, barn or anywhere else you desire. Ready to open all your cool refreshments with its intimidating teeth; this wall mounted cast iron bear will express its owner's character and sense of humor, attracting the eye of all their guests. REMOVE BOTTLE CAPS EFFORTLESSLY: Boasting extremely durable, single mold cast iron and a unique antique look, this cool beer bottle cap opener is made to last for many years to come. Crafted with minute attention to details, this wall mounted bottle opener will get the cap off of even the toughest bottles with ease! MAKE A UNIQUE GIFT: Are you looking for a great gift for the beer lovers in your life? Perfect as a gift for groomsmen or hunting enthusiasts, this cool, vintage bear bottle cap opener is sure to make an impression, every time! HARDWARE INCLUDED: This cool bear bottle cap opener comes complete with three, #6 ¾" aluminum wood screws per opener to help you mount your vintage cast iron beer bottle opener on the wall, right out of the box! The screws are black, offering an impressive, unicolor result. 100% Order Satisfaction Guarantee: Because all our products are backed by a 14-day money back guarantee, you can order with peace of mind! With nothing to lose, order your Grizzly bear cast iron beer bottle opener today! Better yet, order enough to give gifts to your beer loving friends! If you have any questions about this product by Indie Craft Supply, contact us by completing and submitting the form below. If you are looking for a specif part number, please include it with your message.